The vote totals by each of the city's 15 wards, which generally include about 6,500 residents. Each ward includes a handful of smaller election districts that each range in population from a few hundred to more than 1,500 people. Even so, many election districts register very small vote totals. Any representation of numbers also ends up skewing the information is some way. One of the problems with geographic maps like the ones above is that they don't do a good job of representing the relative influence each ward or district has due to the number of votes cast there. A district with a lot of geographic area -- but few votes cast -- can look more influential than it really is. By the way: You can click each ward block to zoom in on the election districts. To zoom out, right click (or on a Mac track pad, use two fingers and click). They're at the top in the large format -- click or scroll all the way up. + The vote total for the mayoral election: 13,469. As we've said before, that's a small slice of the city. It's worth having a discussion about ways to shake up the primary process in an attempt to get more people to vote and/or to set up some sort of runoff process. + See also: The look at the ward-by-ward vote totals by Amanda Fries in the Times Union. 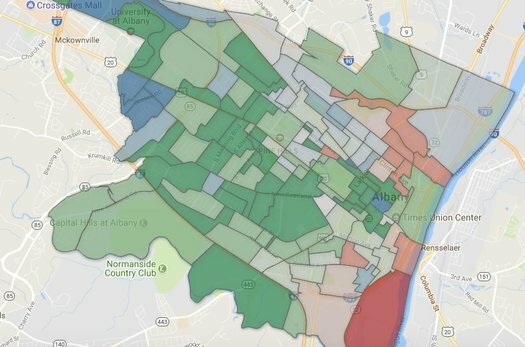 + The voting data used for these maps is via a FOIL request to the Albany County Board of Elections. The data was in a pdf that didn't render text as text. We used optical character recognition to extract the numbers, so it's possible there are some errors. Here are the numbers in csv if you'd like them. three votes cast. There's what, only three buildings in the district that may even have apartments? Wow! What a lost opportunity. Essentially half the dems in the city voted for the mayor and half against. A slightly stronger SINGLE candidate might have won. They'd need to better the performance of Commisso and McLaughlin combined by less than 2 percentage points to win. I think we're finally, after 100 years, at a point where it might be possible for a great candidate to win an actual competitive election. That's normal in many places in the USA but unheard of in Albany. Stand by for 2021. By the way we got some truly awful new common council members. Real loss there.